As I am the queen of procrastination, I decided to join this years round of Blogtoberfest. One post, every day throughout October. Hopefully, I will manage to post every day and not procrastinate! Blogtoberfest is run by the lovely Tinnigirl and Curlypops. I’m also thinking about signing up for Socktoberfest, a month long celebration of knitting socks! As it happens, I have a recently started pair of socks on the needles. These socks are for my darling Husbitect. And, umm, remember I mentioned procrastination? I may have had the yarn for these socks in my possession for over a year. Ahem. This is my third pair of socks, all three using a pattern which includes an afterthought, or peasant heel. My first socks are pictured below. Are you going to join Blogtoberfest or Soctoberfest? Maybe you are planning on both? You procrastinate and you knit! I like you. Oooh Socktoberfest….now there’s a good idea….I have a pair of socks to finish…..
Good luck with your daily blogging. I love you socks, they match!! I hate that most of my socks don’t have matching stripes at the ankle part. Afterthought heels don’t fit my feet. 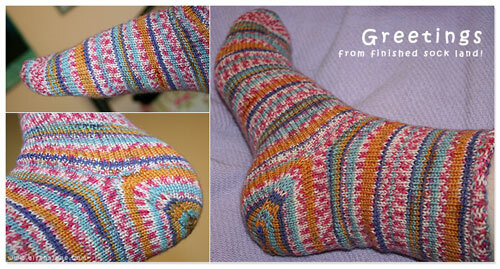 These socks are beautiful……I haven’t made any for ages but am determined to have a go again this winter. Where did you find the pattern for these? I wouldn’t mind trying these……. Katherine – I am planning on doing just that! Maybe I can blog everyday AND finish my socks! Deb – I found the pattern from an Australian magazine, called Yarn. Shall send you the link + publisher details. The heels kind of do, from the unravelling to the same colour, but not quite.